Published on Thursday, July 2, 2009. This article appears in the August/September 2009 issue of American Craft Magazine. 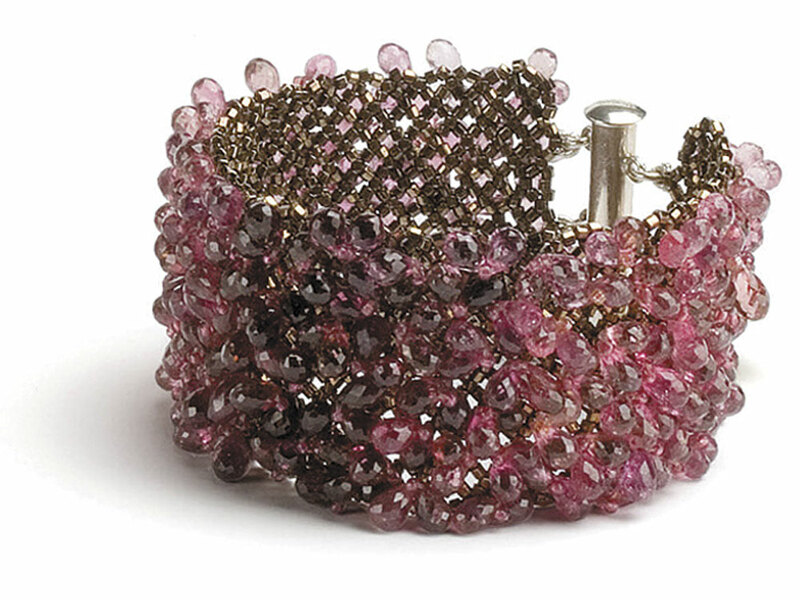 Susan Hoge made her name creating beaded jewelry in gemstones and gold. At the height of her success, she went back to school for a “radical change.” Now 46, she has gone in a provocative new direction—beadwork that’s beautiful but not pretty, such as her Chordata ____ series, 2007–2008. Cranbrook was the creative tonic Hoge needed. There she experimented with sculpting in chocolate, hair and blown sugar. 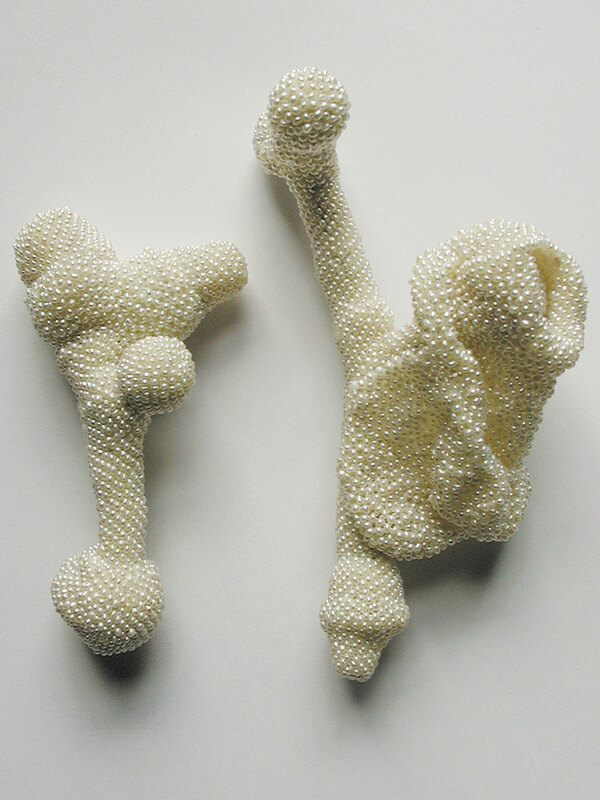 She then returned to beadwork, making a series of small, sculptures of lustrous seed pearls over a skeleton of “banal objects” (twigs, foam, silicone). Skin and bones, mystery and illusion are themes of these pieces, which are anatomically suggestive and meant to unsettle. Sometimes Hoge ups the squirm factor by displaying them with surgical instruments. One of Hoge's Fluffy bracelets, photo/Shell Hensleigh. Another Fluffy bracelet, photo/Shell Hensleigh. 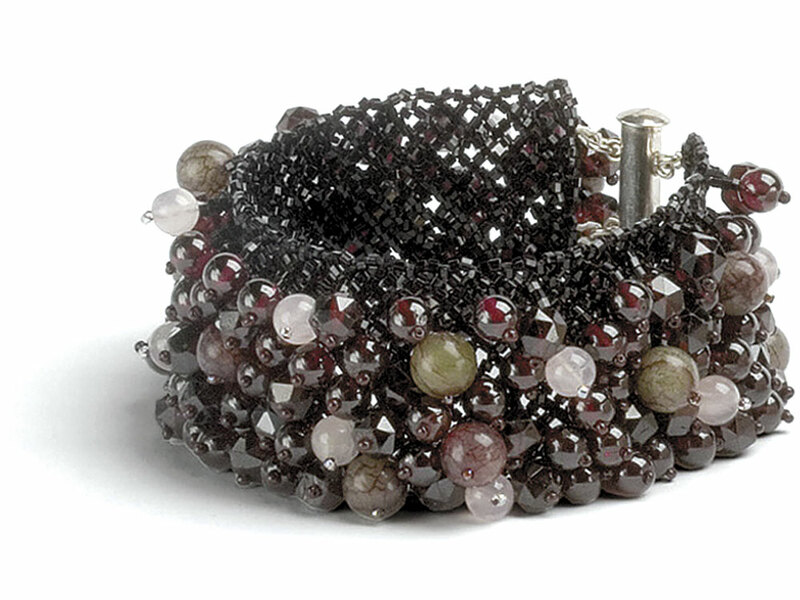 And another sensuous Fluffy bracelet, photo/Shell Hensleigh. 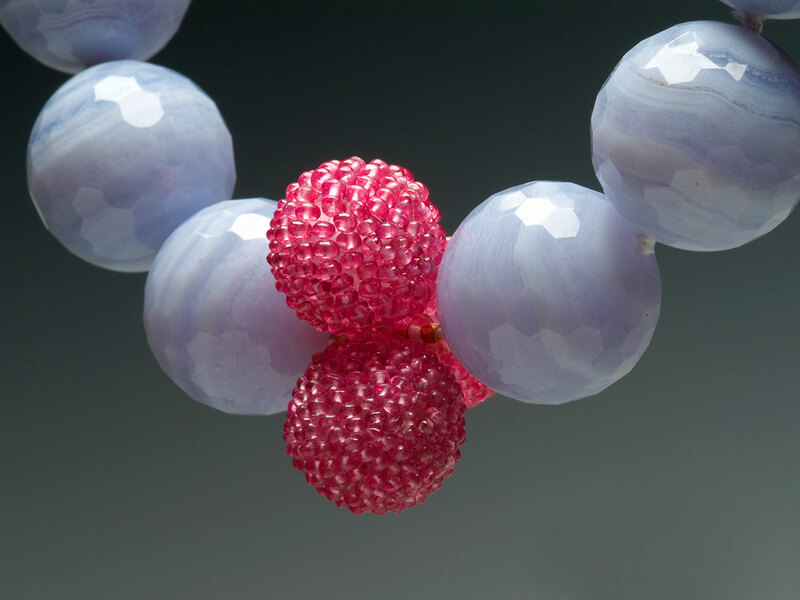 Matthew Barney Necklace (detail), netted spinel beaded form, blue lace agate beads, photo/Shell Hensleigh. From carved crayons to recycled dishes, Diem Chau offers tales of innocence, nostalgia and experience. Shonquis Moreno takes us virtual shopping at afsoun.com, an online gallery offering contemporary art jewelry. Past the sense of play and wonder, Sanchez’s colorful jewelry fashioned from Lego bricks gives evidence of expert technique. Joyce Lovelace takes us through the artist’s innovative journey. The Hawaiian artist keeps his cultural traditions alive with modern designs.